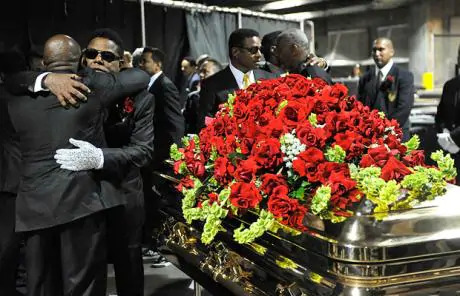 Michael Jackson's death is officially the second biggest internet news story of the 21st Century, according to new figures. Only the election of President Barack Obama to the White House eclipsed the the death of the 'King of Pop' at the age of 50, research by Global Language Monitor (GLM) found. Jackson's death received more coverage than the Iraq War, 9/11 and the global financial meltdown, last year's Beijing Olympics, Hurricane Katrina, the death of Pope John Paul II and the Tsunami. In the 72 hours after his death, the Jackson story generated twice as much web news as coalition troops entering Iraq did in the same period. It has also become the ninth biggest story in global print media since the start of 2000, according to GLM. GLM recorded trends in word usage of the top 5,000 print and electronic media sites worldwide for the study, tracking news stories within the first 72 hours after the event. The citations for Michael Jackson in the mainstream media numbered in the thousands while his citations on the internet were in the millions. Paul Payack, president and chief word analyst of GLM, said: "The death of Michael Jackson has resulted in a global media event of the first order. "The fact that he has broken into the top media of the 21st Century is a testament to the global impact of the man and his music. "The strength and depth of the global media coverage only adds to his already significant legacy and shows no sign of abetting." The singer's death was only placed ninth in overall print media coverage, one place behind the death of Pope John Paul II. Watch tributes and clips from the concert celebrating King of Pop's life. The American writer recalls an unguarded conversation with Jackson that touched on fame, childhood and Biblical betrayal. Michael Jackson's ten solo albums map out the evolution of the hottest styles from the 1970s to the 1990s. Trial LOVEFiLM's DVD rental service and Telegraph readers will get two free cinema tickets. High performance and refined finishing. Test drive or order a brochure. Earn 2.50% gross/AER (variable) with instant, penalty-free access 24 hours a day. Apply online in minutes.